Dr Dzifa Dey, a Physician Specialist & Rheumatologist and Lecturer at the School of Medicine and Dentistry, University of Ghana Medical School, says five out of every Ghanaian get diagnosed with Autoimmune Disease (AD) on weekly basis. According to her, the condition which makes the immune system to attack other internal organs until they are totally destroyed has become a worldwide concern. Speaking to Nii Ogbamey Tetteh at a New Year party organised by ‘The Rheumatology Initiative’ (TRI Ghana) to celebrate with people living with ADs and the children of New Life Orphanage in Accra, Dr Dey, who is also the Director of TRI Ghana, said the term ‘Autoimmune Disease’ (AD) refers to a varied group of illnesses that involve the immune system attacking specific organs in the body. “Research shows that autoimmune diseases are on the increase worldwide. Almost every week, we have about five people with lupus –another form of AD- on admission in Ghana. It is becoming more common and we are yet to find out whether it has to do with the environment or we are diagnosing it more because we are more aware of it. You can never be sure until a lot of studies or research have gone into it,” Dr Dey stated. She added that there are a group of conditions that are referred to as autoimmune condition but in all of the ADs, the underlying problem is that the body’s immune system becomes misdirected and attacks the very organs it is designed to protect. Dr Dey also noted that autoimmune diseases are not curable but can be managed with medication and proper lifestyle. “You need constant monitoring and constant treatment to make sure that all your organs are not affected. But once it affects your brain and kidney, it becomes difficult to manage. You will need very strong drugs that we call neurosuppressants to try and suppress the immune system. But the condition can be life-threatening if you leave it untreated,” she warned. Some of the patients living with the disease told the paper that though they could not go about their usual day-to-day activities like they used to, proper medication and counselling from TRI Ghana had helped them to live an almost normal life. The Rheumatology Initiative (TRI Ghana) is a non-profit organisation dedicated to providing education, advocacy and research into autoimmune rheumatic conditions in Ghana and Africa. “Our basic aim is to try and reassure patients, educate them enough about this condition so that they can be accepting of the treatment and management, and encourage them to live healthy lifestyles,” she said. 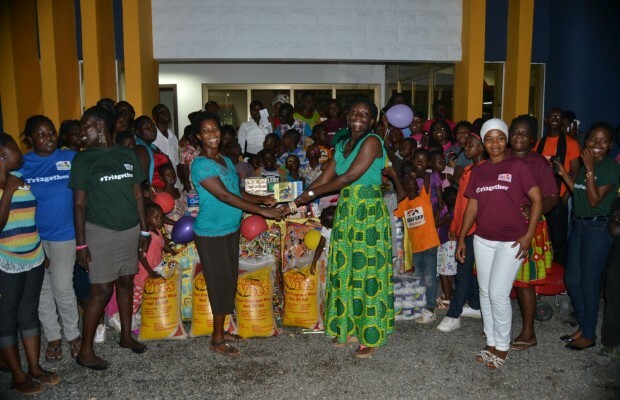 Dr Dey, on behalf of TRI Ghana, also donated bags of rice, stationery and toiletries worth thousands of Ghana Cedis to New Life Orphanage.